Your local government does not hold membership in ICLEI so there is no cause for concern, right? Not so fast ! Agenda 21 is often implemented without ICLEI membership. In fact, almost every community in this country has been tainted by the UN initiated Agenda 21 assault on individual property rights and its web of innocuous sounding vernacular. For sure, those with membership are at the forefront of implementation of Agenda 21. Most of those communities have serious, often well-intentioned, participants who are dedicated to carry out the UN mission usually without any understanding of the conflict that exists between Agenda 21 and the traditional American system. Education for Sustainability works well to soften local leaders and prepare the way for a democratic transformation from an American System of individual rights to an International System of collective rights. My local community is Bristol Township in Bucks County Pennsylvania. Bristol does not hold ICLEI membership as far as I can tell, however, we have a draft comprehensive plan that reeks Agenda 21. It was approved in June 2008. You see, there are other vehicles that the UN has to provide assistance in implementing their schemes. In this case, it appears as though our State government assumed that role. Let’s step through the comprehensive plan and highlight some obvious areas where Agenda 21 roars its ugly head. This document was prepared with financial assistance from the Pennsylvania Department of Community and Economic Development through a Land Use Planning and Technical Assistance Program (LUPTAP) grant. This update of the Bristol Township Comprehensive Plan is prepared under the authority granted by the Commonwealth of Pennsylvania to municipalities to prepare comprehensive plans in accordance with the provisions of the Municipalities Planning Code (MPC). Article III of the MPC provides requirements regarding the content and information that must be included as part of a comprehensive plan. … The plan provides a blueprint for housing, land use, community facilities, and transportation. It is not a legal document but assists decision-makers. It contains no rules or regulations but forms the basis for zoning regulations. A visit to http://www.newpa.com/ is an eye-opening experience. It is hard to fathom and difficult to describe the extent to which the State of Pennsylvania is promoting its own self-destructive policies thru an extensive grant program. The Vision of the Comprehensive Plan is a reflection of Agenda 21. 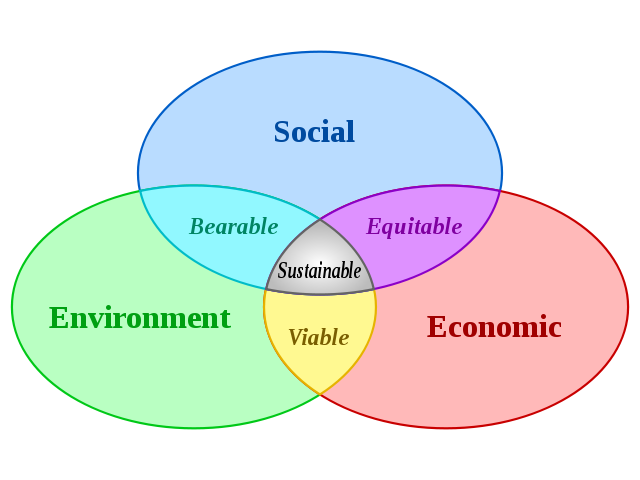 To illustrate this point I will juxtapose the “Overall Goal” against a graphical representation of the Agenda 21 Three E’s or Three Pillars of Sustainability. The overall goal of the Comprehensive Plan Update is to create and maintain the physical, economic, and social environment of the township. Proper accommodation of the 2008 to 2018 population in sound housing supported by superior municipal services. Maintenance and/or re-establishment of land use patterns which create healthful, convenient and prosperous living and working arrangements, including employment opportunities for township residents. The vision also expresses an interest in expanding the means of alternate transportation. Apparently, automobiles are not considered a “sustainable” transportation method in large-scale. The remainder of the document progresses through every area of community life. All the polices in each section can be traced back to the goals specified in the vision section of the document and that vision is our local interpretation of Agenda 21. It is striking to see the authoritarian attitude which exudes from this planning document. The vast majority of our community is in private hands, yet the local government views the entire geographic area in terms of “resources” that it can control or regulate. There is occasional lip-service given to the individual land owner, however, it is clear that the individual is subordinated in favor of the community as a whole. I invite you to read the plan in the following reference link. Reference: The Bucks County Comprehensive Plan is founded on the long history of innovative planning carried out by the Bucks County Planning Commission and the values and principles embodied in the concepts of sustainable development and stewardship. Thank you for this post. This is all a nightmare. Our government is being run by the UN,,,,actually the elite maniacs that created the UN and use these plans they pass off “for the good of the earth” really to enhance their control on the lives of every human on the planet. It is all a part of their NEW WORLD ORDER that they have been building for a very long time. For people who do not know about this, PLEASE LOOK IT UP! If you have ever felt like things in this world don’t make sense, or if you wonder why politicians do what they do, or in general just have a bad feeling about the direction we are headed……this is the answer to all of that and more. We all are in great danger,,,,and people need to wake up! Things to look up: Agenda 21,NDAA (national defense authorization act), Council on Foreign Relations,RFID CHIP, Chemtrails, Alex Jones, FEMA PRISON CAMPS IN AMERICA, Re education camps in America in army manuals, Illuminati, New World Order, Bohemian Grove, INFOWARS.com, United Nations Lucist Trust, Lucent Technology at 666 5th avenue NY NY, Federal Reserve private business, central banking, Eugenics, population reduction, Georgia Guidestones, Denver International Airport Murals, Bilderberg Group, Rothschilds, Rockerfellers, 13 Illuminati bloodlines, Fritz Springmeier,Project Paperclip,Rex 84, USC title 42 section 666, Operation Northwoods, and so much more….This information is life changing and finally is the breadcrumb trail to the truth that we all have a right to know. You are right when you say it is all across America. It is in school districts, counties, and cities and towns. It is not called Agenda 21 or ICLEI. It is smart growth, sustainable development, partnerships, etc. A lot of good people in local government don’t know. Back in Feb. 2012 I was looking at Cumberland County website and it showed the commissioners vision for 2015. It really read like it was from Agenda 21 vision to me. Then in October 2012 I went back and the whole web site has been updated and the mission that was there is gone. But it talked about sustainability, smart growth, partnerships, etc. It just made me realize that it is everywhere. It is happening in Harrisburg City right now… as I write. The planners are condescending, radical progressives. The mindset is all over Montgomery Co. Their planning commission in Norristown is huge and is obsessed with trails and encouraging people to ride bikes to work (which none of them do). Hilly, inclement and 3 hands to ride, talk on phone and drink your venti latte? How many people do you see riding to work – 1 person out of 815,000 in Montco. Yet they spend a lot of time and money on this, and claim the public wants this from surveys. We pay for those surveys. The county is debt and still giving out grants. Now they’re trying to convince several small townships near me to regional their p.d.’s. They promoted it would provide 24/7, help neighboring communities who rely now on State PD coverage, and give officers more opportunities for advancement. It would be controlled by a new commission. These people do not believe in less spending and rules, only more. Help!